Mariners that were buried (Or a memorial) in Llyn cemeteries, up to 1991. Evan Jones, Pant Awel, Dinas, who drowned with the S S MEMPHIS at Mizen Head, November 17th 1896 and was buried at Crookhaven, November aged 20. John Williams, Brynffynnon, May 19 – 1890 aged 37 yrs and was buried at sea off Nova Scotia whilst on a voyage to Boston. R J Roberts, Fireman SS KYLEBANK, 7 January 1944. Frederick Henry, son of Henry and Jane Roberts, Bodafon, Sarn who lost his life on the S S CAYO BONITO, October 11th 1917 aged 21 yrs. John Evans, Isgraig, lost his life during the sinking of the ship ‘CAYO BONITO’ October 11th aged 17 yrs. John Evans, Tai’r Lon, Sarn who lost his life off the ship WYNNSTAY, June 20 – 1901 aged 20. William Jones, Lon Las, Mariner September 30 – 1809 aged 23. William Williams, Ship Inn, Tudweiliog, drowned at the loss of the ‘SS NORANMORE’ in the Black Sea, Aug 25 – 1901 aged 29 yrs. Hugh Davies, son of Capt Evan Davies, 7 Exeter Rd, Bootle, Liverpool, lost at sea, torpedoed by German Submarine, Sept 16, 1917. Serving 3rd Officer, H M T ‘ARABIS’ aged 18 yrs 9 mths. Richard Williams, Tyddyn Mawr, Penllech, died 5 March 1866 on board the ship ‘CAMBRIAN MONARCH’ about 120 miles off Scilly Islands, while on passage from Pisaqua to Falmouth, aged 17 years and was interred here March 12th. Hugh Davies, Bryn Awel, Tudweiliog died at sea 12th May1924. Evan Jones, Penybont, Bryncroes, drowned on the banks of Yarmouth. April 12 – 1878 yn 58 oed. William Jones, Glasfryn, Sarn, died whilst on a voyage from Calcutta to London, on board SS ‘NELLORE’, November 2 – 1913 aged 24 , and was buried here. Owen Jones, Trefwerin, who lost his life whilst on a voyage to London on board the ‘CEFNAMLWCH’ March 1866, 17 yrs. David Jones, Llainwen, Penllech lost his life at sea / 1909 – 1940. 19 Seamen of the Cyprian, Hydref 14 – 1881. Hugh Thomas, Pentref Edeyrn, died on board the ‘LADY YOUNG’ aged 27, and was buried at Point Lobos, Peru, April 29 – 1876. Henry Jones, Henborth, Porthdinllaen, lost from the Schooner ‘WALTER ERLICK’ in the year 1882 aged 31. William Roberts, Lon Llan, Edern lost his life in the sinking of the ‘SS EDERNIAN’ August 20 1917. Robert Jones, Master Mariner who was lost on the ‘FOUR BROTHERS’ in Conway Bay. Dec 29th 1860 aged 76. Evan Jones Evans who lost his life August 7 – 1944 aged 37 with the ship ‘AMSTERDAM’ when the British Forces landed in France. Capt William Jones, Barque ‘MEDUSA’ dear husband of Catherine Jones, Bryn Villa, Llangwnadl, October 19 - 1906 – aged 65 . St Mair Church, Morfa Nefyn. Thomas Williams, Brynraur, Morfa Nefyn, who lost his life on the ‘SS NORTH DURHAM’ December 1893 – 40 yrs. John Victor, Mate of the ‘SS NORMANDY COAST’ lost at sea during an attack by the enemy 1913 – 1945. In Loving Memory of those lost at sea during the Great War 1914 – 1918. In loving memory of our dear son Griffith Wyn Williams, Brynawen, Morfa Nefyn who lost his life along with the crew of the ship ‘DERBYSHIRE’ when she sank in the sea off the coast of Japan, September 9. 1980. John Jones, Morwr, Porthdinllaen, died April 3 1901 – 67 yrs. Richard Randolph, Mariner, January 22 – 1758 – aged 29. Hugh Ellis of Nevin, Mariner, May 2 – 1822 – aged 44yrs. Robert Roberts, from this town mariner October 7 – 1826 – 31 yrs. 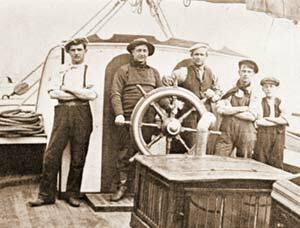 Owen Thomas, Master of the Schooner ‘JOHN THOMAS’ April 8 – 1854 – 39 yrs. Robert Davies of this town, Mariner, July 10 – 1836 – aged 71 yrs. Capt Mathew James, son of Mr John Jones, P.C Officer, 7th January 1845 aged 23 yrs. John Pritchard, Mariner, 28 Sept 1814, aged 42 yrs. Evan Roberts, former Master of the ‘CYGNET’ August 18 – 1848 – 71 yrs. John Pritchard of Nevin, Mariner, 15 March 1805 – 73 yrs. Rowland Williams, Mariner of this town 15 June – 1802 – 83 yrs. Hugh Charles of this town, Mariner, 31 May 1808 – 61 yrs. Thomas Davies, mariner, 21 Feb 1847 aged 75 yrs. John Thomas, Bryn Bras, mariner 30 April 1821 aged 78 yrs. Robert Griffith, former master of the ‘ROBERT’of this place, 12 August 1846 in his 42nd year. Capt Griffith Jones ‘LIZA BRINDLEY’, son of William and Laura Jones, Penbryn, November 27 – 1854 26 yrs. Washed ashore/ unknown to man, but not to God/ since identified; Edward Gough Williams, Wireless operator, ‘SS GRELDON’ of Ayr, Scotland, buried Oct 20 – 1917 aged 17 yrs. Harold McCormick of Liverpool, buried Oct 19 – 1917. Capt Emanuel Williams, Pennantigin, Llangian, August 4 – 1896. George Walker Cochran of Oxton. Drowned through the torpedoing of R M S Leinster’, October 10 – 1918 aged 59yrs. Evan Richards, Lon Las, Cilan, who died while on passage to the West Indies 1848 – 1889. Richard Harry Griffith, Morwel, Abersoch, died on board ‘SS CLARISSA RACLIFFE’ and was buried at sea September 10 1911 18 yrs. Capt Richard Davies, Brynhyfryd, Bodfean. October 15 – 1903 – 56 yrs..
Capt Richard Jones, Bryn Glas, Nefyn, formerly of Tyddyn y Coed, April 5 – 1871. Capt Robert John Williams, ‘SS NORTH ANGLIA’ died in Havana, Cuba, April 7 – 1899 yn 33 yrs. Evan John, Second Officer of the ship ‘ELLIOT’ who lost on his passage from Carrizel to Baltimore, aged 21 yrs. Hugh Griffith, Shop Penygraig, who drowned near Cape Verde Islands, November 13 – 1864, 19 yrs. Capt Evan Jones, Tir Rhos, who drowned and was buried at Kiel, Scotland, February 7 – 1883 - 47 yrs. Thomas Jones, Bodrydd, who drowned in the wreck of the steamship ‘MONK, January 7 – 1843 - 38 yrs. Capt Richard Griffithd, Cefn Ynysoedd, Llanfaglan formerly of Bryn Mawr, Aberdaron, died May 29 – 1895 – 74 yrs..
Capt John Williams, Pwlldefaid, November 19 – 1896 yn 64 yrs. John Williams Attendant of the ‘BARDSEY LIGHT’ who lost his life in crossing to Aberdaron – April 11 – 1841. 41yrs old. Thomas Williams of Bardsey Island, mariner aged 49, 30th November 1822. He perished in the execution of his duty as master of the ‘BARDSEY LIGHT’ tender, which was wrecked on the 30th November 1822. John Thomas, Morfa Trwyn Glas, who died on the ship ‘ANTILOCHUS’ Novemeber 26 – 1958 - 46 yrs. Buried in Djakarta, Java. Thomas William Ellis M.B.E. Master Mariner, Glanymor, Aberdaron Feb 16 – 1950 aged 50. Capt W Thomas Evans, Deuglawdd, Aberdaron, 1867 – 1945. Capt William Jerman Jones, 1890 – 1936. Rowland Richards, Master Mariner, Afallon, Aberdaron also of Glasgow 1870 – 1934. Capt David Williams, Cardigan View, Pwllheli, October 3 – 1905 – 71 yrs. John Jones, Shop Pencaerau, who was unfortunately drowned by the melancholy shipwreck of the ‘MONK’ steamer on the Caernarvon Bar, the 7th day of Jan 1843, aged 13 yrs. A sailor of the Great War. HMS ‘STEPHEN TURNESS’ 13 Dec – 1917. Griffith Williams Cefnhengwrt in the Parish of Llanwnda, who drowned at Portinllaen Bay. March 27th 1818 aged 16yrs. John Jones Wern Pistyll drowned August 18th 1796 aged 14yrs, also William his brother happened of the same accsidence in the same time in the 13yrs of his age.